The Bird Cage Puzzle is a good computer version of a well-known brainteaser that requires you to arrange numbered tiles in the correct order. The (quite unnecessary) plot: "Within the Emperor's Palace there stand five birdcages in five different rooms. Everyday at sunrise, the birds begin to sing, creating wonderful melodies that please the Emperor very much. The Emperor believes that changing the location of the birdcages will create even greater melodies. The Emperor is anxious to test his hypothesis, and has enlisted your help in finding the most efficient route for relocating the birdcages. Are you up to the task?" 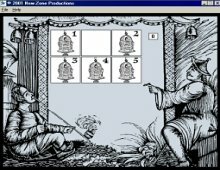 The game includes 3 variations of the basic puzzle, and a catch: the Emperor is asleep in the room with cage #5, so you cannot move that cage lest you awake the Emperor. Although the puzzle is not hard to solve, finding the least number of steps to arrange the cages is quite challenging. If you enjoy brainteasers, this little gem will keep you entertained for a while, with good representation and even nice background music to boot.